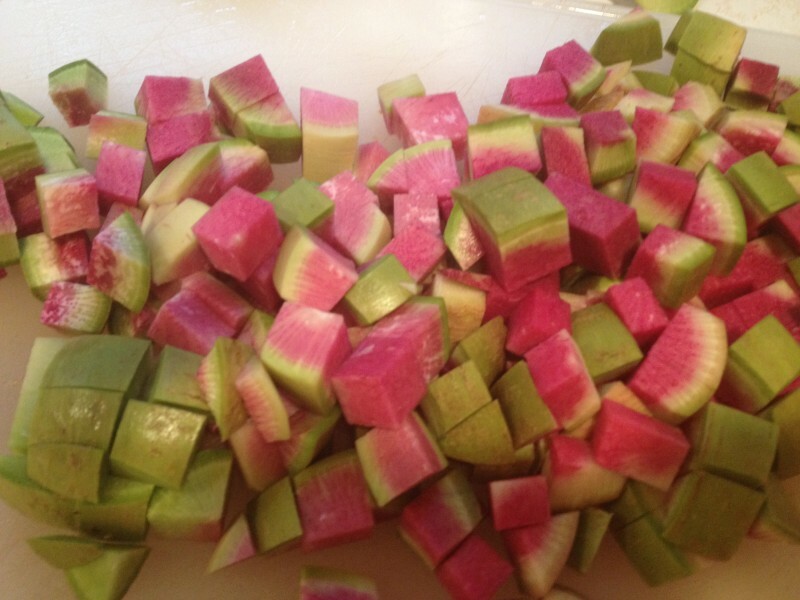 This is a great end-of-summer dish if you can find these brightly colored radishes. We get them from our Community Supported Agriculture (CSA) program through Vertias Farm in New Paltz, N.Y. Farmer’s markets are also a great source. The watermelon radishes don’t taste that different than their small, red salad-staple counterparts. Roasting them, however, alters their sharp bite, replacing it with a sweet mellow tang. Scrub, top and tail the watermelon radishes. Cut them into half-inch cubes. Place them in a large baking pan and sprinkle liberally with salt and pepper. Drizzle with olive oil. Bake for an hour, or until browned on the edges.You can serve most root vegetables this way. Try adding celery root, turnip or parsnip. Cauliflower, while not a root vegetable, stands up nicely to this preparation, especially if you add several cloves of chopped garlic.